Acute subdural and parenchymal hemorrhage, from an underlying AVM, in a patient with fibromuscular dysplasia (FMD). 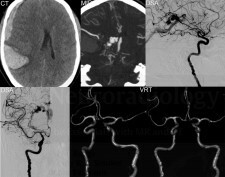 Intracranial aneurysms are a well known associated finding in FMD, with the occurrence of intracranial arteriovenous malformations less common. On axial CT, both the acute subdural and parenchymal hematomas are well demonstrated, together with midline shift and compression of the right lateral ventricle. 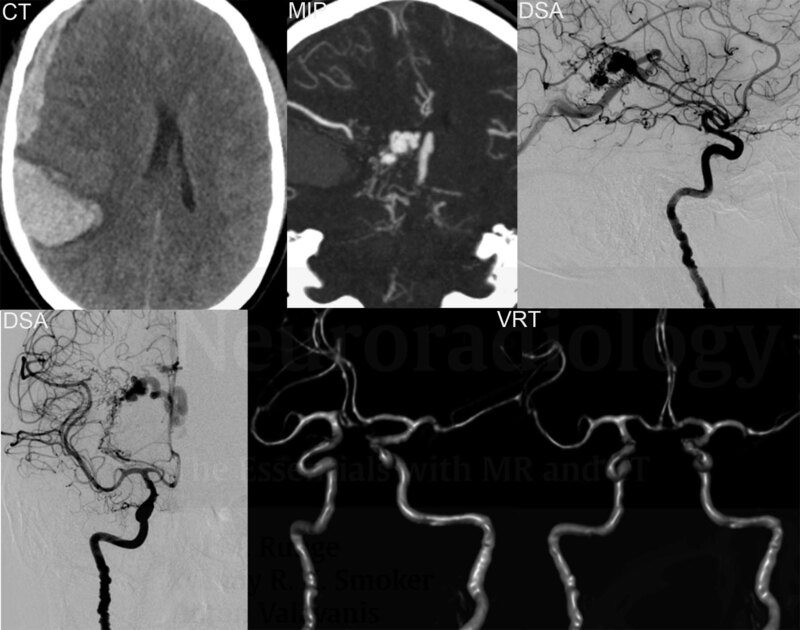 The coronal thick MIP CTA demonstrates a portion of the nidus, medial to the parenchymal hemorrhage, together with prominent midline draining veins. Both the nidus and draining veins are well visualized on lateral and AP projections from DSA. Fibromuscular dysplasia within the distal internal carotid arteries is easily identified on the DSA, with a “string of beads” appearance. This finding is somewhat subtle, but can also be recognized, on TOF MRA.